So I wanted to write up a post here for the blog with the most basic of sous vide recipes for home cooks to get you started. They are quite easy to learn, so I recommend just using the freebie resources online to learn the basics, then upgrade to a cookbook or video instructions for the more in-depth recipes. For the most part, simple sous vide recipes involve three key components: the prep, the cooking, and the finishing steps. Each of these areas is often simple and the directions for cooking are just based on time and temperature. Later on in this post I am going to highlight some of the most significant examples of these for your reference. But, before that, we’re going to take a look at how to cook some of the most common foods with sous vide. I'll speak in general terms, assuming you are somewhat familiar with the sous vide cooking process, but you can also watch the videos for each for more details! We're going to cover steak, chicken, pork chops, brisket, and eggs. If you want a specific recipe, let us know in the comments and we'll add it! Without a doubt, steak is one of the most popular foods that people cook with sous vide. For that matter, getting the perfect steak is often a key reason that people get involved with sous vide in the first place. The ideal steak is one that is seared and flavorful on the outside while being exactly right on the inside. So, if you’re trying to create a medium-rare steak, you want the inside to be pink and moist. Getting this right in a frying pan is incredibly difficult and you’ll often end up burning the outside and/or overcooking the middle. This happens because the outside of the steak cooks faster. Likewise, it’s difficult to determine whether you have the inside precisely right, without cutting the steak open (which ruins the presentation). Cooking a steak conventionally is also very time sensitive. Even just having it in the pan a minute too long can ruin it entirely. On the other hand, sous vide cooking allows you to make the perfect steak every time. The first step for doing so is to just season the steak as you want to and then seal it in the bag. Often people will just rely on salt and pepper for the seasoning but you can go with whatever your preference is. Adding some herbs to the bag along with a little olive oil (or another type of oil/fat) also helps in getting a great steak. When it comes to cooking the steak, you just need to pick the right time and temperature. Generally speaking, the thickness of the steak will affect what time you choose and the temperature is based on how you want your steak to end up (rare, medium rare, etc.). 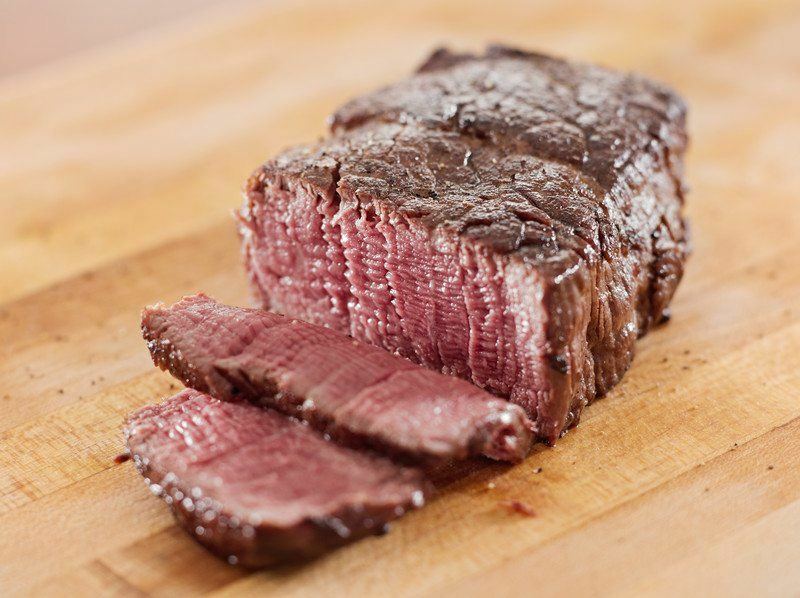 For example, rare steak is typically cooked at around 120°F, while a medium one is around 140°F and well-done is around 160°F. You can tweak from there to figure out exactly what temperature works for you. In most cases, you would be cooking the steak for around an hour but anything up to four is normally fine, especially for thicker cuts. As with other types of meat, you do still need to sear the steak separately after it has been cooked via sous vide. However, this is easily achieved and you can use any techniques that you would when cooking a conventional steak. For example, you could use a cast iron pan with a little bit of butter or oil. Alternatively, some people even use blow torches to briefly char steak and other meat before serving. Regardless of the method, searing steak like this would typically be fast. After all, the meat is already cooked to perfection, so you just need to get the outside exactly how you want it. 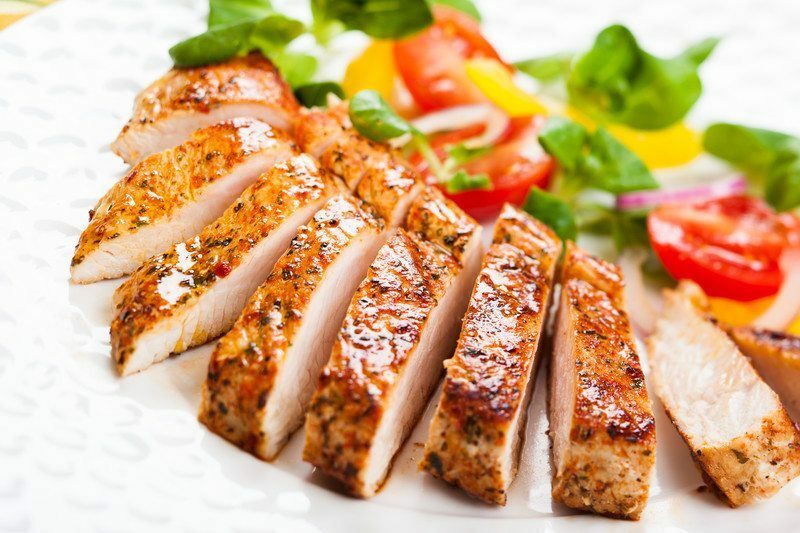 Chicken breasts are another common food to cook in sous vide. Like steak, they tend to be sensitive and conventional methods often result in overcooking. Prior to cooking, you would prep the chicken breasts the same was as any other approach. For example, you might season them with herbs and spices, and you could also add in lemon slices, if you chose to. As with steak, there is a range of temperatures that you can use with sous vide chicken. These range from around 140°F to 160°F. The lower temperatures result in moister chicken that falls apart easily, while the higher ones tend to be overcooked. Generally speaking, you would want to be somewhere between 140°F and 150°F to get the best possible results. However, this does come down to personal preference, so you may want to try out different temperatures to see which outcome suits you. The cooking time will vary depending on the type of chicken that you’re cooking and how thick it is. However, in most cases, you would be looking at between one and four hours, regardless of the temperature you’re using. As with steak, you can also sear the chicken afterward if you want to or you could briefly bake it in the oven to get the finish you want. Now, doing so may not be relevant for chicken breast itself, but you can cook any type of chicken via sous vide. So, if you cooked bone-in pieces of chicken with skin, you may want to ensure the skin is nice and crispy before you serve the dish. 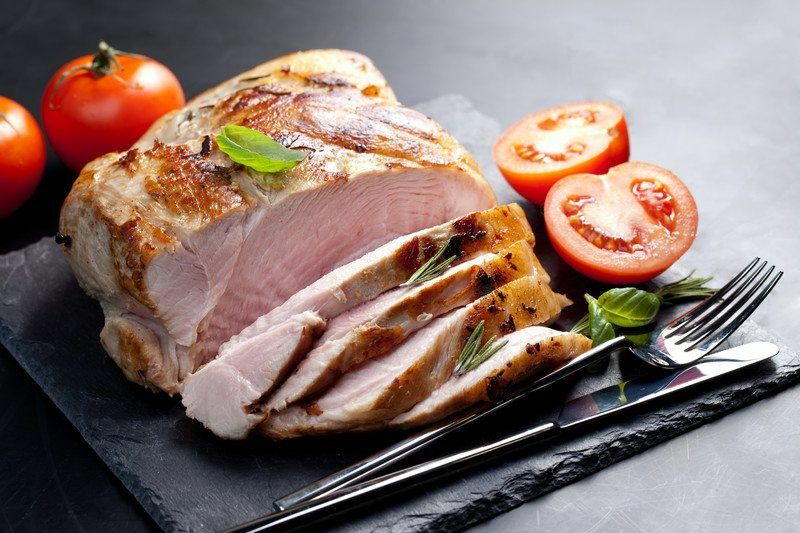 Pork is another good option for sous vide cooking, regardless of whether you are doing a pork chop, pork tenderloin or even an entire pork roast. Sure, you can make good pork conventionally as well but it is tricky to get right. For the most part, the temperature and cooking times for pork end up being fairly similar to steak. In particular, you would cook rare pork at around 130°F, medium-rare at 140°F and well-done at 160°F. In each case, you would cook the pork for at least an hour but up to four if you wanted to. The longer cook times would be especially relevant to thick pieces of pork, particularly if they included a bone. The prep and finishing work is also similar to steak. So, to prep, you rely on whatever herbs and spices you would normally consider. This could include salt and pepper but you might get more creative as well. This part is all about the flavors you like, so feel free to experiment. Browning the meat after sous vide cooking is easy as well. The first step is to simply dry it off and then use a skillet or cast iron pan along with some type of fat. Many people choose butter but there is no shortage of options. The process isn’t going to take long because the meat is already fully cooked. Additionally, you want to make sure that the pan is very hot when you add the meat. Otherwise the searing process could take too long and you would risk overcooking the meat. Most of the time, brisket is a barbecue meat and there’s no reason why you cannot cook it that way. However, brisket does tend to demand a considerable amount of attention, which isn’t always desirable. In contrast, cooking brisket via sous vide lets you get a great outcome without all the effort. And, once again, relying on sous vide means that you can get consistent results every time, without having to guess. It is even possible to get the same smoky flavor with sous vide cooking, simply by the way that you finish the meat. 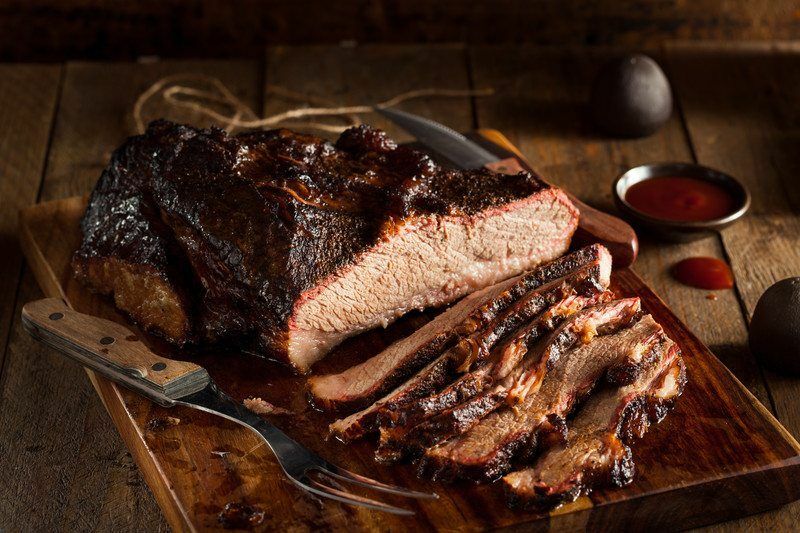 Compared to other meats, brisket requires more prep work because you have a specific outcome that you’re looking for. To start off with, you need to cut the brisket in half (to make it fit in the bags). Each half is then rubbed with pepper and salt, and placed into a separate bag. Once in the bags, you add a few drops of liquid smoke, seal then and store in the fridge for a few hours. This allows the flavors to permeate the meat. After this point, the brisket can be cooked in the sous vide. The common temperatures are either 135°F or 155°F. The lower option will create a texture similar to steak, while the higher temperature will result in brisket that readily falls apart. If you’re going with the higher temperature (155°F), cooking will take from 24 to 36 hours. Otherwise, the cooking is 36 to 72 hours. Once cooked, the brisket needs to be cooled to room temperature. It can even be stored in the fridge for as much as a week like this. Finally, as with other types of meat, you need to finish the brisket. This can be done on the grill or in the oven using similar techniques that you would normally use with this type of meat. Again, your techniques would mostly come down to personal preference and be based on the specific outcomes that you are looking for. Target Temperature: 140ºF – 150ºF depending on your personal taste! Eggs may seem like a more unusual option but they can work exceptionally well with sous vide cooking. In fact, sous vide eggs can be amazing. And, once again, it is much easier to get consistent results this way than with conventional methods. But, to be fair, the term sous vide is slightly misleading here. You do still use sous vide equipment to cook eggs but you’re not actually doing so under vacuum. After all, you wouldn’t want to vacuum seal eggs – that wouldn’t be pretty. In effect, you’re basically slow cooking eggs. Still, the end result is similar and the technique is typically referred to as sous vide eggs. With this approach, you’re just cooking the eggs directly in their shells, which makes it an incredibly simple process. With eggs, the cooking temperature has a dramatic effect on the end result. As such, you need to choose the temperature based on the outcome you want. For example, when the cooking time is 40 minutes, the eggs are similar to poached at 145°F. In contrast, they are soft boiled at 150°F or 155°F, depending on how soft you like them. You can also take the process one step further. 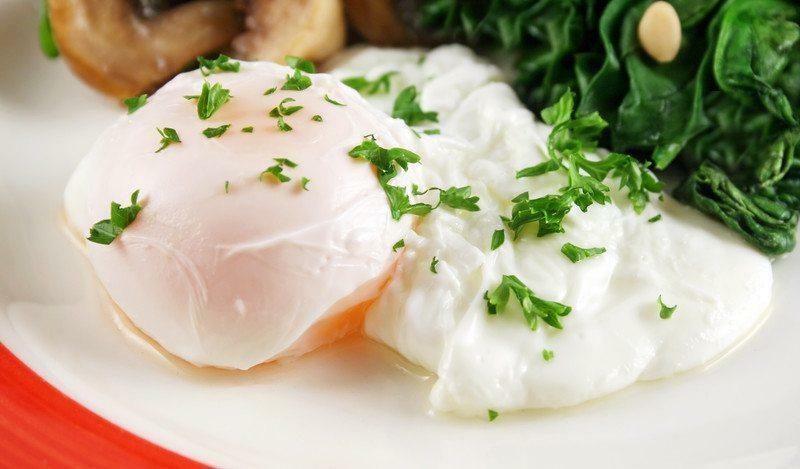 In particular, if you want poached eggs, you can cook them to the desired softness and then briefly poach them in boiling water. This works much like searing in that you’re just trying to change the visual appearance without cooking the food much longer. Note: All of the videos features on this page feature the Chefsteps Joule, my #1, all-time, absolutely favorite immersion circulator. 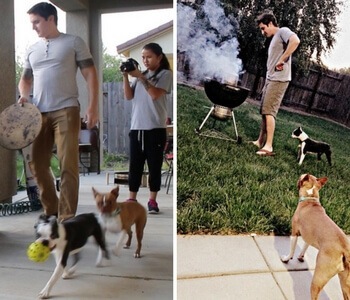 That's a link to my full review – check it out if you are interested in getting your own. My review includes a comparison to other similar circulators! The entries above detail some of the main foods that you can make with sous vide cooking but the list certainly isn’t exhaustive. Instead, sous vide is a fairly versatile process, especially as it is possible to vary both the cooking time and the temperature. With this in mind, there are many other options for sous vide, including some that are relatively unusual. For example, you can make sous vide mashed potatoes by cooking sliced potatoes for around 30 minutes and then pureeing them through a sieve. Likewise, it is possible to cook yogurt, custardy desserts (like crème brûlée), purees and even kale through sous vide, provided that you have the right recipe at hand. As you can see, sous vide cooking is a flexible process and it isn’t just limited to cooking meat. Instead, you can make many different types of meals. The recipes above are all general guidelines and there is the potential for significant variation to the time and the temperature that you use when cooking. For example, cooking food for longer than suggested doesn’t result in overcooking in the traditional sense. However, the texture of the food can change considerably. This can be seen with chicken. If you cook that too long in sous vide, the end result will be stringy. But, it will still be moist. In fact, some people actually prefer that outcome. Because of this, both the temperature and time can dramatically affect your outcomes. This is particularly significant if you are planning an entire meal. You can figure out the best options by starting with general concepts (like the ones above) and using trial and error to figure out the best settings for you. But, recipe books and food sites can also be powerful places to start. For example, we previously posted a list of the 10 Best Sous Vide Cookbooks and these cater for all skill levels. There are also some fantastic recipe sites to check out. One of these is chefsteps.com. The site offers amazing recipes but what makes it stand out is the sheer level of detail. The posts go into depth about sous vide cooking, including images and information about what effects different cooking temperatures and times have. Now, Chef Steps isn’t exclusively about sous vide, so there are many other recipes on there as well. But, they do have a specific section for sous vide, which includes recipes, information and guides. Another powerful site is seriouseats.com. Like Chef Steps, this site covers a range of cooking types, with sous vide just being one option. Their recipes truly are fantastic though and they have been featured in many of the roundups on this site. Once again, the site does have a section specifically for sous vide. This includes a range of recipes and also information about relevant techniques. There aren’t as many sous vide recipes as I would like on there but the site still makes a good resource, especially if you are still learning the basics. Another interesting place to consider is amazingfoodmadeeasy.com. The site does go a little overboard with advertising but it does offer some cool recipes to check out. The unique thing about this site is that it has a strong focus on modernist food and techniques. This may help you learn some different ideas and means that many of the recipes are somewhat unusual. While this isn’t my favorite sous vide cooking site, it is a good one if you want to break out of the box a little bit. Anova is actually a brand that offers an especially popular immersion circulator (which I have reviewed in the past). But, the company’s site at anovaculinary.com is worth relying on for their recipes, even if you don’t actually use the product itself. The recipe section of the site is well-designed and extremely easy to follow, with no shortage of images. The recipes themselves are specifically designed for Anova’s product. But, you could easily make them with any other sous vide equipment. One final site to consider is sousvidetools.com. The emphasis of the site is on actually selling sous vide products, although it may not be the most reliable place to purchase from. Regardless, the recipes on the site are truly worth looking at and they cover a wide range of categories. This includes more traditional recipes, like beef, poultry and pork, along with more unusual ones. For example, there are sous vide recipes for cocktails, sauces, soups and desserts. The variety makes it an interesting choice if you want to use your sous vide setup for more than just main meals. Now, the site is a bit of pain to navigate but the selection of recipes does more than make up for that challenge.